Start off your visit on the 3rd (Sat): contemplate in the serene atmosphere at Matthias Church, make a trip to Fisherman's Bastion, admire the masterpieces at Hungarian National Gallery (Magyar Nemzeti Galeria), then get to know the fascinating history of Janoshegy, and finally contemplate the long history of Liberty Statue. On the 4th (Sun), you'll have a packed day of sightseeing: appreciate the history behind Hősök tere, see the interesting displays at House of Terror Museum, then contemplate in the serene atmosphere at Dohány Street Synagogue, and finally contemplate in the serene atmosphere at St. Stephen's Basilica (Szent Istvan Bazilika). For more things to do, photos, traveler tips, and more tourist information, you can read our Budapest trip itinerary maker site . If you are flying in from Hungary, the closest major airport is Budapest Liszt Ferenc International Airport. August in Budapest sees daily highs of 32°C and lows of 18°C at night. Cap off your sightseeing on the 4th (Sun) early enough to travel to Florence. 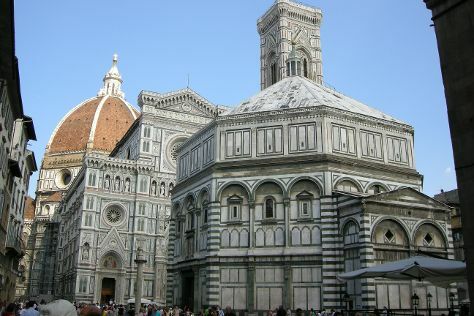 Kick off your visit on the 5th (Mon): appreciate the extensive heritage of Piazza del Duomo, take in panoramic vistas at Campanile di Giotto, take in the spiritual surroundings of Cathedral of Santa Maria del Fiore, make a trip to Palazzo Vecchio, then make a trip to Piazza della Signoria, and finally take in the spiritual surroundings of The Baptistery of St. John. Get ready for a full day of sightseeing on the 6th (Tue): don't miss a visit to Piazzale Michelangelo, admire the masterpieces at Pitti Palace, then admire the masterpieces at Uffizi Galleries, and finally examine the collection at Academy Of Florence Art Gallery. For traveler tips, maps, reviews, and other tourist information, you can read our Florence trip planner. You can do a combination of flight and train from Budapest to Florence in 5.5 hours. Alternatively, you can fly; or drive. In August in Florence, expect temperatures between 35°C during the day and 20°C at night. Wrap up your sightseeing on the 6th (Tue) early enough to take a train to Rome. Do some cultural sightseeing at Palatine Hill and St. Peter's Basilica. Get some historical perspective at Piazza Navona and Catacombe di San Callisto. Step out of Rome with an excursion to Villa Adriana in Tivoli--about 36 minutes away. There's still lots to do: explore the galleries of Vatican Museums, ponder the design of Trevi Fountain, don't miss a visit to Sistine Chapel, and pause for some serene contemplation at Basilica di Santa Maria Maggiore. To find more things to do, traveler tips, reviews, and more tourist information, use the Rome holiday maker site . You can take a train from Florence to Rome in 2 hours. Alternatively, you can drive; or fly. In August, daytime highs in Rome are 38°C, while nighttime lows are 24°C. Finish your sightseeing early on the 9th (Fri) so you can travel to Alghero. Eschew the tourist crowds and head to Dolphin & Whale Watching and Spiaggia dell'Arco. Nuraghe Sant'Antine and Santa Trinita di Saccargia will appeal to history buffs. Explore Alghero's surroundings by going to La Pelosa Beach (in Stintino) and S'Archittu (in Cuglieri). To find reviews, more things to do, and more tourist information, read Alghero online road trip planner . Fly from Rome to Alghero in 4 hours. Alternatively, you can do a combination of ferry and car; or do a combination of train, ferry, and bus. Traveling from Rome in August, plan for slightly colder nights in Alghero, with lows around 20°C. Cap off your sightseeing on the 12th (Mon) early enough to travel to Lisbon. On the 13th (Tue), step into the grandiose world of Castelo de S. Jorge, appreciate the extensive heritage of Belém Tower, and then make a trip to Jeronimos Monastery. 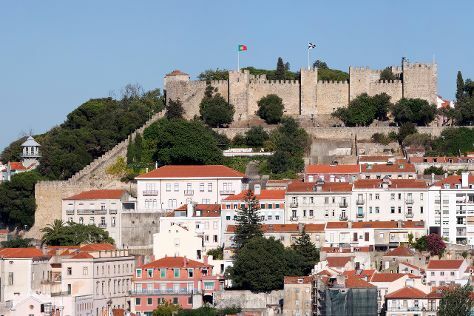 On the 14th (Wed), you'll have a packed day of sightseeing: explore the historical opulence of Castelo dos Mouros and then explore the historical opulence of Park and National Palace of Pena. For where to stay, photos, maps, and other tourist information, go to the Lisbon trip planning tool . Fly from Alghero to Lisbon in 7.5 hours. Alternatively, you can do a combination of ferry and car; or do a combination of ferry and car. Traveling from Alghero to Lisbon, you'll gain 1 hour due to the time zone difference. In August, plan for daily highs up to 35°C, and evening lows to 20°C. Finish your sightseeing early on the 14th (Wed) to allow enough time to travel to Stockholm. Start off your visit on the 15th (Thu): see the interesting displays at Skansen, then find something for the whole family at Grona Lunds Tivoli, and then take an in-depth tour of Vasa Museum. Keep things going the next day: get to know the fascinating history of Monteliusvagen, examine the collection at Royal Armory, explore the historical opulence of Royal Palace, then head off the coast to Stockholm Old Town, then take in the spiritual surroundings of Riddarholm Church (Riddarholmskyrkan), and finally explore the world behind art at Moderna Museet - Stockholm. For other places to visit, reviews, more things to do, and more tourist information, go to the Stockholm online trip itinerary maker . Traveling by flight from Lisbon to Stockholm takes 7 hours. Alternatively, you can drive; or do a combination of car and train. The time zone difference moving from Western European Time to Central European Time is 1 hour. Expect little chillier temperatures when traveling from Lisbon in August; daily highs in Stockholm reach 24°C and lows reach 13°C. Wrap up your sightseeing on the 16th (Fri) to allow time to travel to St. Petersburg. Start off your visit on the 17th (Sat): steep yourself in history at Palace Square (Dvortsovaya Ploshchad) and then explore the world behind art at The State Hermitage Museum. Get ready for a full day of sightseeing on the next day: examine the collection at Russian Museum, admire the striking features of Peter and Paul Cathedral Петропавловский собор, then examine the collection at Saint Isaac's Cathedral, and finally take in the architecture and atmosphere at Church of the Savior on Spilled Blood. To see reviews, where to stay, photos, and other tourist information, use the St. Petersburg online tour itinerary planner . Traveling by flight from Stockholm to St. Petersburg takes 4.5 hours. Alternatively, you can do a combination of ferry and train; or do a combination of ferry and bus. Traveling from Stockholm to St. Petersburg, you'll lose 2 hours due to the time zone difference. In August, daytime highs in St. Petersburg are 25°C, while nighttime lows are 15°C. Finish up your sightseeing early on the 18th (Sun) so you can travel to Istanbul. Kick off your visit on the 19th (Mon): get engrossed in the history at Topkapi Palace, explore the world behind art at Kariye Museum (The Chora Church), and then wander the streets of Ortakoy. Get ready for a full day of sightseeing on the 20th (Tue): enjoy breathtaking views from Galata Tower, contemplate in the serene atmosphere at Suleymaniye Cami , contemplate in the serene atmosphere at Sultan Ahmed Mosque, then take in the spiritual surroundings of Hagia Sophia Museum / Church (Ayasofya), and finally steep yourself in history at Basilica Cistern. To find maps and more tourist information, use the Istanbul holiday planner. Fly from St. Petersburg to Istanbul in 7.5 hours. Alternatively, you can drive; or take a bus. Traveling from St. Petersburg in August, things will get a bit warmer in Istanbul: highs are around 34°C and lows about 25°C. Finish up your sightseeing early on the 20th (Tue) so you can travel back home.